Single track Streamliners “Liners” are usually a fantasy for most recumbent riders. Why? – these bikes are all hand crafted custom builds for a specific rider with purpose. With exception of the very few – most “liners” are used for racing only. Example – the current world record for Human Power is held by Sam Whittingham @ 82.3 mph. The reason one does not see these liner’s out on the open road for daily use is that the hard sided streamliner shell is unforgiving in cross wind turbulence of any kind. The vehicle becomes terrifying to handle until the handling skills have been learned. Think of a sail boat “with out” a keel – got the picture “wink”. This is the reason most liners are used in low wind situations or for the track. I have found there is a whole lot of distraction just keeping the single track Liner upright let alone navigating it through traffic. On the other hand three-wheeled Velomobiles “Velo’s” are safer user-friendly streamlined platforms that are at home on the open road. They use a recumbent trike chassis configuration that adds lateral stability for cross winds and climbing. However, beware – there still can be serious lateral cross wind push as velo speeds get faster. Logically, the trike configuration for a streamliner shape is a desirable safer vehicle to use over the single track Streamliner. The best part of this comparison is Velo’s are manufactured for sale to JonQ public – Streamliners are not. Comparatively – technology has improved the Velomobile into a more user-friendly streamliner for open road use. It has been discovered that most Velo’s have an impressive performance window regardless of the third wheel resistance. This link talks of how a single track Streamliner racer improved his time with a third wheel. http://www.trisled.com.au/records.html The challenge most riders have – is to mentally over come the vehicle weight and the perceived third wheel resistance factor vs the aerodynamic benefits. One needs to carefully analyze its intended use for the trade off to be substantial. Unfortunately many riders never get past this hurdle. My explanation to this dilemma is recognizing the three fundamental factors of recumbent bicycling. There are three categories of riding a bike. 1st – the “uphill” – – A four man team in 2009 RAAM illustrated a High Racer recumbent can be as strong at climbing as an upright bike. On the other hand, the heavier Velo can attack roller hills with massive amounts of momentum that gives amazing results – but – when the momentum wears off and uphill grind starts, at least a Velo won’t wobble and fall over at slow climb speeds. It was pointed out to me by a velo driver that he can climb easier in his velo. Don’t confuse the ease of climbing with the speed of climbing. He explained that he can be in a slow easy spin and arrive at the top without the pain of trying to keep a upright bike stable when climbing slow. So, there is another dynamic for which one has to think about. Unless time is of an essence in racing – who cares if you arrive a couple of minutes later at the top with a grin on your face. 2nd – “level ground” – most “not all” recumbents have an advantage of aerodynamics. 3rd – the “down hill” – is where most recumbents become cruise missiles. So – out of these three categories – the average recumbent platform dominates “two” out of the three. Healthy competition: There will always be the “upright vs recumbent” challenge. Streamlining just puts a whole new spin into the scenario. Annually non-faired recumbent race teams compete in Race Across America “RAAM”. The RANS recumbent team actually gained time over the leading upright team in the Rocky Mountain climbing stages in 2009. My feeling are the “recumbents can’t climb” argument will eventually fall to the way side of the uninformed over time. Every year it has been observed that a modest number of upright racers are going recumbent for Ultra endurance events. Long time recumbent bike rider - former general aviation pilot - always looking for an adventure to experience - aero dynamics fastenates me. 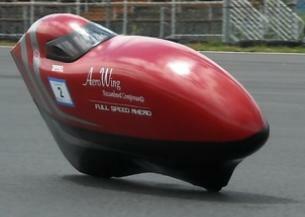 This entry was posted in recumbent bicycle aerodynamics and tagged Bicycle Racing, Streamliner, Velomobile. Bookmark the permalink.